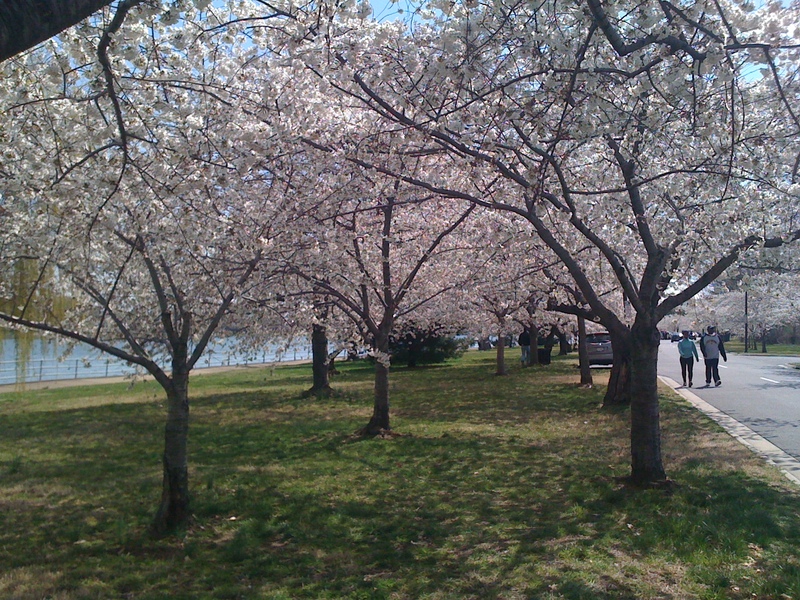 Last night,at the last minute, Superking and I decided to head out to the Cherry Blossoms in DC the next morning. We wanted to go next week on a weekday so it would be less crowded but scheduling was not cooperating. So we woke up really early this morning (alarm went off at the ungodly hour of 6:30am...we never wake before 8am in our house) and off we went. We arrived at Haines Point shortly after 8am...parking was easy and crowds were minimal at that hour. 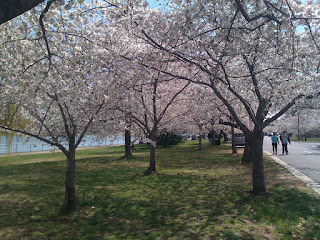 We walked all around the Tidal Basin and had quite the exciting day goofing off in DC...all before noon too! So much fun and excitement that I'm breaking up our day into 3 posts, this being the first. I'm really excited about this one too. That's why I chose to do it first. After Cherry Blossoms we decided to go to Georgetown, check out the line at Georgetown Cupcake, hop in a couple shops, and grab some lunch before going home. 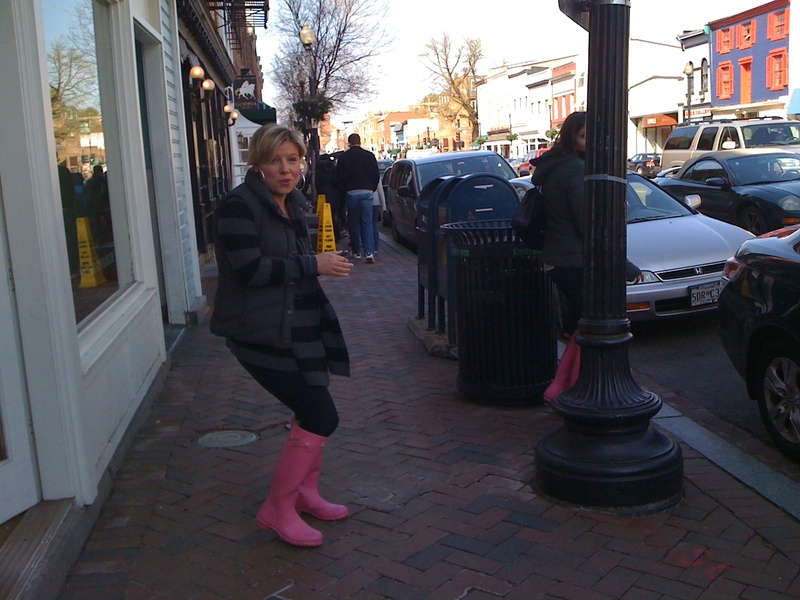 We're walking down M Street approaching one of my favorite shops, Anthropologie, and I see in the window two girls with bright pink galoshes on!! Why is this significant you ask? Because I immediately recognized those boots...the only girls I know that wear them are the DC Cupcake girls from Georgetown Cupcake itself!! And many of you know how much I LOVE their cupcakes! I whisper to Superking, "hey do you see who that is?" He's like, "what are you talking about?" "Its' the DC Cupcakes girls!" And right about that time they come bounding out of the store right in front of us. So Superking calls out to them, "Hey ladies! Would you mind if we got a picture?" They were very friendly and came running over. I totally gushed about how much I loved their show and their cupcakes! We got a great picture and I've been showing it off to everyone I know. It was so cool! 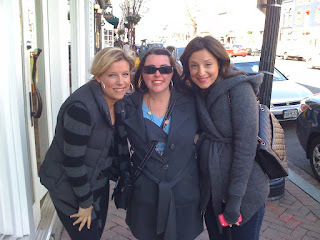 I'm not normally one who gets caught up with celebrities but these girls are hometown heroes, at least in the foodie world. It made my day! To see my other posts about Georgetown Cupcakes click here and here. I love that they were so cool! One thing I'm always afraid of is that I will meet one of the celebrities I really admire, and they're a jerk in real person. I'm glad they were so awesome!